" I purchased this as a replacement for my first CPAP machine. I love the small footprint, the ease of use and setup. I would recommend this machine to others. " " really like it. still learning bells and whistles but, with the p-10 resmed face mask, works like a dream. " The AirStart™ 10 CPAP Machine with HumidAir™ Heated Humidifier is an easy to use CPAP with basic, effective features users have come to enjoy on a nightly basis. Settings are easily accessed and changed on the color LCD display. At 2.75 pounds, this machine is also a great option for traveling. 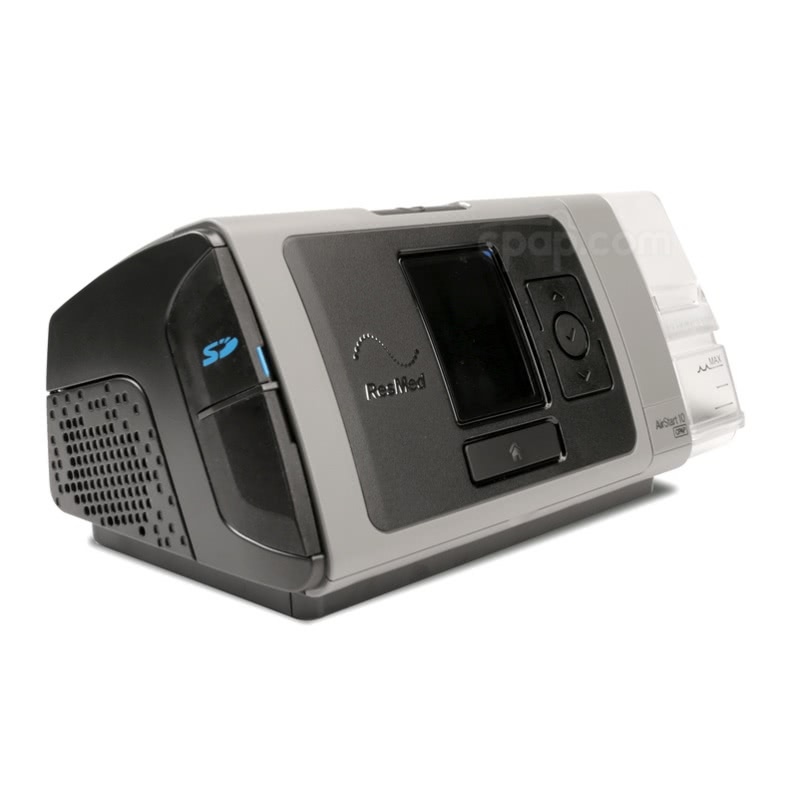 44% of CPAP Machine product buyers choose this product. The AirStart™ 10 CPAP is a basic, easy to use CPAP machine for those looking to add a second machine to a travel residence, or for those who prefer a machine with simplicity. The AirStart™ 10 includes comfort features such as built-in humidification and exhalation relief. The AirStart™ 10 CPAP is a simplified CPAP machine with basic features accessed through the machine's menu. From the display the user can adjust settings such a ramp, EPR, and humidity level. During therapy the display will show the current pressure and humidity level, before going black after a short period of time to avoid extra light in a dark room. Once therapy is completed, the usage hours are displayed. The HumidAir™ Heated Humidifier is built-in to the AirStart™ 10 CPAP Machine to provide warmth and moisture to therapy air on a nightly basis, if desired. The water chamber attaches to the humidifier at the side of the machine and is easily taken out and apart for filling and cleaning. The machine menu features a warm up option to preheat the humidifier so that it is warm at the onset of therapy. If using the AirStart™ 10 CPAP without the heated humidifier, the Side Cover for AirSense™ 10, AirStart™ 10, and AirCurve™ 10 Machines (not included) must be installed at the end of the machine in place of the water chamber. The AirStart™ 10 CPAP includes comfort features that users have come to expect and rely on. Expiratory Pressure Relief (EPR™) allows a drop in pressure for easier exhalation. Ramp allows an increase to prescribed pressure over a set amount of time at the beginning of a therapy session. 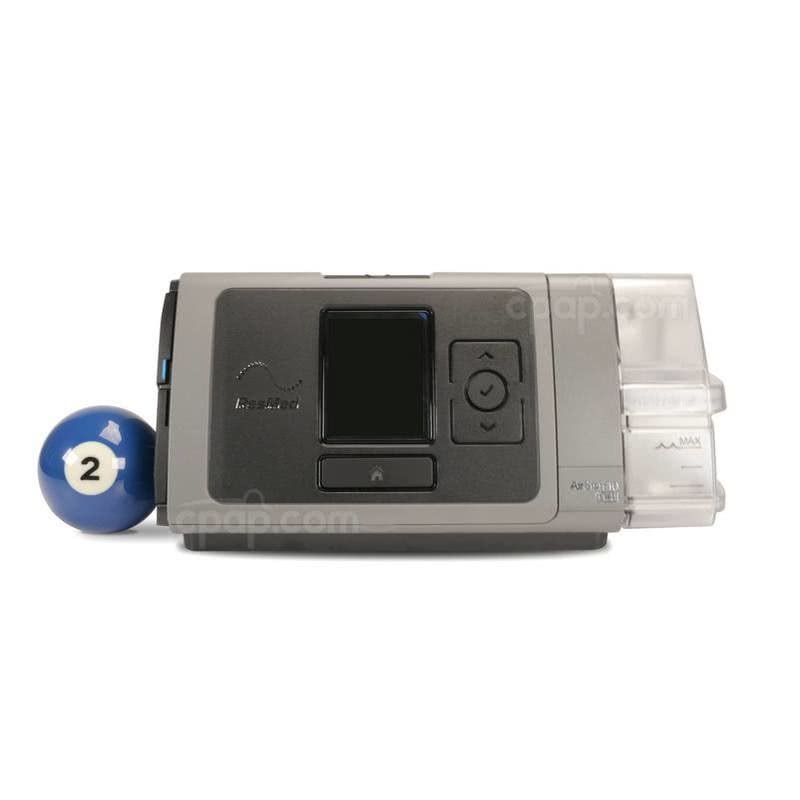 The AirStart™ 10 CPAP records basic compliance data to the included SD card. The SD card can be removed and given to a physician for therapy tracking. FAA Compliance Letter: To view the FAA compliance letter for the AirStart™ 10 CPAP with HumidAir™ Heated Humidifier, click here. Do not fill the water chamber past the max fill line as this could result in water entering and damaging the device. Allow the water chamber to cool for ten minutes after use before handling as it could be too hot to the touch. The machine will display a blue snowflake in the upper right of the screen while cooling is taking place. The water chamber should be washed weekly using warm water and a mild detergent, rinsed well, and allowed to dry out of direct sunlight. The standard water chamber included is not dishwasher safe and should only be hand washed. To view a dishwasher-safe chamber, see the Dishwasher Safe Water Chamber for AirStart™ 10 Humidair™ Heated Humidifier. Purchase the Side Cover for AirSense™ 10, AirStart™ 10, and AirCurve™ 10 Machines separately in order to enclose the machine opening when the water chamber has been removed. This is only required if the integrated heated humidifier is not being used. AirStart™ 10, AirSense™ 10, and AirCurve™ 10 machines denote the water chamber model with an "S" or "C" label. Look directly above the maximum fill line located on the side of the chamber to find the word HumidAir™ and the corresponding letter embossed into the tank. A standard (19mm) hose is included with the purchase of the AirStart™ 10 CPAP machine. The hose is found in the interior, zipped compartment of the travel bag. The zippered nook is located at the point where the cover meets the bottom of the travel bag at the back of the machine compartments. When shopping for replacement parts, the correct tubing size to search for is 19mm, even though the tubing has a 22mm end. 19mm is considered the diameter of the standard tube for this machine. AirStart™ 10 CPAP Machine with HumidAir™ Heated Humidifier: Basic, single pressure CPAP machine with EPR™, ramp, and humidity controls only. Records basic compliance data to SD card. Only available in black. The user manual included with the machine can be viewed and downloaded here: AirStart 10 CPAP User Manual. 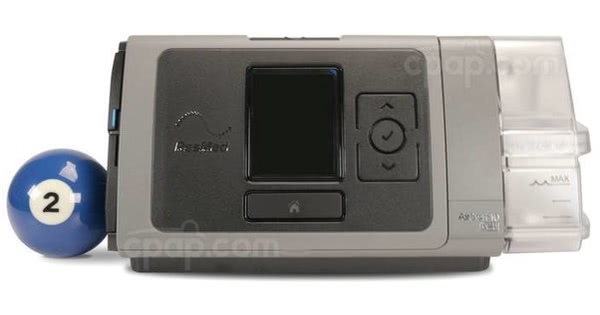 The following information is applicable for the ResMed AirStart™ 10 CPAP Machine with or without the humidifier turned on. Keep in mind that using the heated humidifier will reduce the run time of a battery by approximately half. DC capable: Use the DC Converter 24V 90W For AirStart™ 10, AirSense™ 10, and AirCurve™ 10 Machines to operate the AirSense™ 10 CPAP from a DC power source (battery). ResMed Power Station II Battery Kit for AirStart™ 10, AirSense™ 10, & AirCurve™ 10 CPAP Machines: Use this complete kit including: the lithium-ion battery, the compatible DC cable, and the PSU adapter to power the AirStart™ 10 machine when AC power is not available. AirStart™ 10, AirSense™ 10, and AirCurve™ 10 Machine 24V Power Converter for Freedom Travel Battery Pack: This converter is necessary for using the Freedom Travel Battery Pack for CPAP machines with the AirStart™ 10 CPAP. Failure to use the ResMed DC Converter 24V 90W For AirStart™ 10, AirSense™ 10, and AirCurve™ 10 Machines can damage the machines. The PSU Adapter for the ResMed AirStart™ 10, AirSense™ 10 and AirCurve™ 10 Series is included in this kit. Use the adapter to charge the battery with the External 90 Watt Power Supply for ResMed AirStart™ 10, AirSense™ 10, and AirCurve™ 10 Series CPAP and BiPAP Machines. The RPS II Battery Kit for AirStart™ 10, AirSense 10™, and AirCurve™ 10 machines comes with a carry bag. When using the double configuration, the bag will hold an additional battery cell. An access panel designed into the bag, allows the battery to be charged or used while it is inside the travel bag. The Freedom Travel Battery Pack is a lightweight lithium ion battery, weighing only 1.7 lbs. Combined with the ResMed DC Converter 24V 90W For AirStart™ 10, AirSense™ 10, and AirCurve™ 10 Machines it can be used as a great travel power companion for the AirStart™ CPAP Machine. 150W Modified Sine Wave Inverter Compatibility: The 150W inverter combined with the Freedom Travel Battery Pack will provide an AC outlet to plug the AirStart machine into the Freedom battery, however will provide a very low run time. It is NOT ADVISED to use this inverter to power the Airstart machine with the Freedom battery. Use instead the 24V converter. Deep Cycle Lead Acid Batteries are the same type of batteries that can be used with boats and cars. These are lead acid batteries that CPAP.com does not sell. Deep Cycle Lead Acid Batteries used to be the only portable power option for CPAP machines, but now there are many other batteries that work as well. Deep Cycle batteries are typically sold at auto parts stores.